1. Mix the Thai curry paste with the oil and toss the steak in the mixture until evenly coated. Place on a preheated griddle pan for 1-2 minutes each side, then allow to rest for 2-3 minutes before slicing. 2. Meanwhile, arrange the salad onions, cucumber and coriander on a large platter and add the steak. 3. 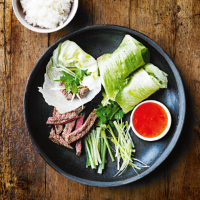 Using the leaves as wraps, add some steak, vegetables and coriander, roll up, dip into the chilli sauce and enjoy. Serve with sticky rice.